I bought this game for my collection as fully working but unfortunately it had sound problem. The FM part was very distorted and the drums (which are samples) were missing. I noticed that someone attempted already to repair the sound section. 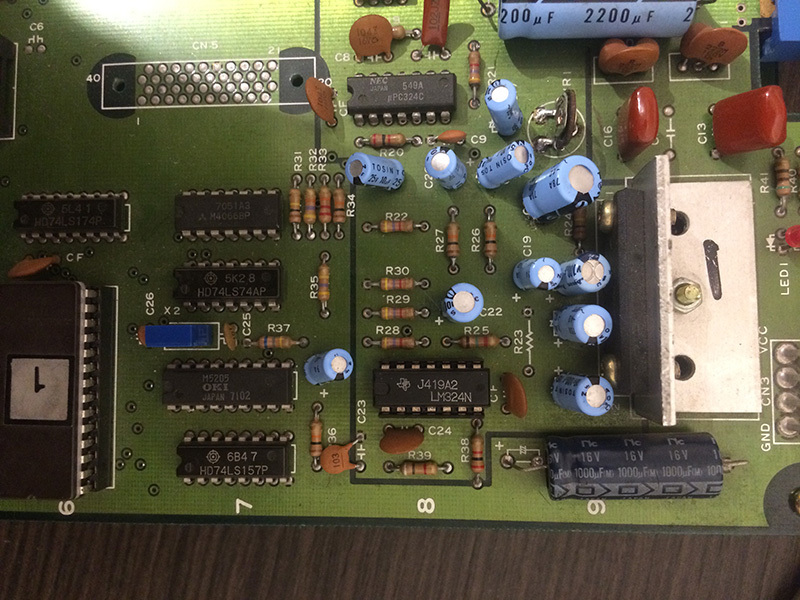 The game has no schematics and unfortunately, as a protection, Tecmo covered all the traces with a special paint, so it is really difficult to trace the connections. 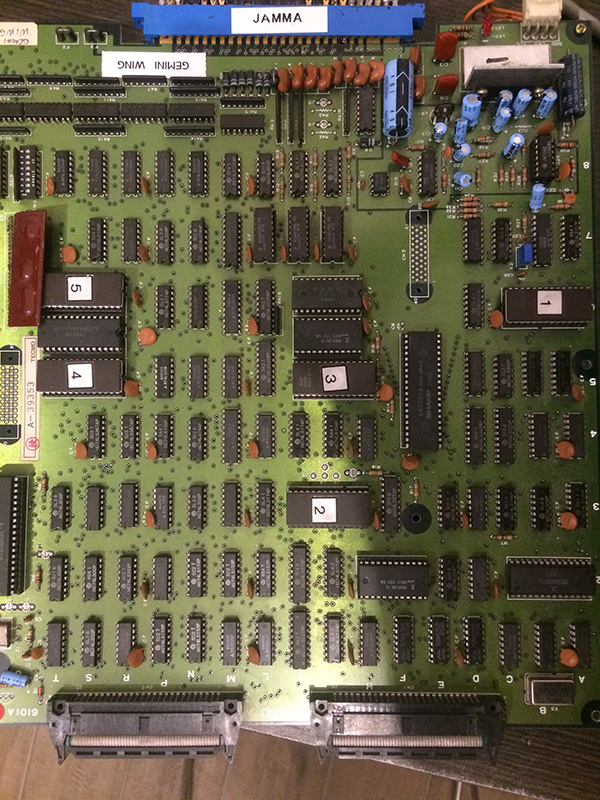 The game runs on the exactly the same board as Silkworm even if the pcb code code is different. With Silkworm board in hand I could confirm the flying wire was not original, so I proceeded to disconnect it. The game now had no FM music and only samples! With my sound probe I proceeded to “listen” to the music which offcourse was being clearly produced from the OP amps but disappeared at one point between the resistors. The cicruit was very complex and I couldn’t follow up very well without seeing the traces. A bootleg , which is an exact reproduction of the pcb , could be very useful but I hadn’t any. After some hours, I noticed that one of the resistor ( R26) was moving a little bit and with a screw driver I could confirm it wasn’t soldered well on the pcb! Actually there were three of them that weren’t soldered correctly and this was a factory fault because they didn’t fill completely the pad (you can see on the pic the gap without solder ). After soldering the three resistors the music and samples were restored but still I had this ugly distorted sound! I was about to desolder the amplifier to change it when I saw something casually that catched my eye. 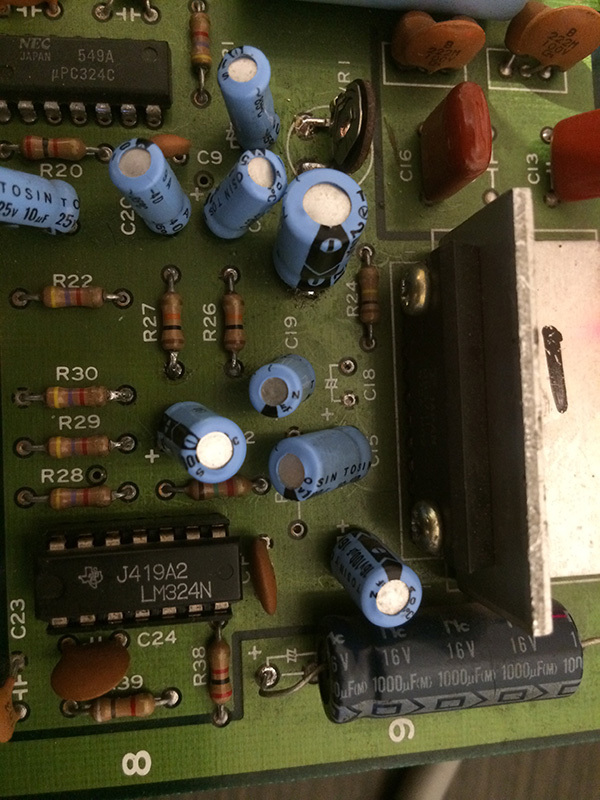 In comparison to Silkworm pcb, on my Gemini Wings there was an additional capacitor in pos. C18 and it was a different model than the others. It was added by the previous repairer for unknown reasons. Often the manufacturers prepare the pcbs to add different models of amplifiers therefore they design additional circuits which are not used. 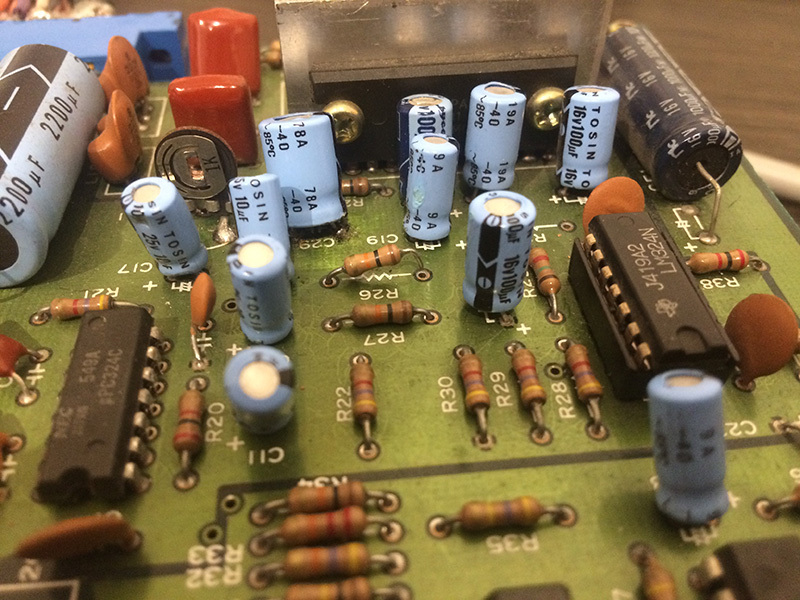 – generated as master clock for the graphics circuit (oscillator on the cpu board, not sure if 24.00MHz or 24.18MHz). It has recently been discovered that the ending sequence of this game (the “the end” text transforming into the Tecmo logo) is making use of raster effects for a nice image zooming/distortion which is highly dependent on the cpu clock and the video clock. For more details, just ask and I’ll point you to some videos. MAME has recently implemented these raster effects, but the above data is still missing. Also, if you have time for it and if at all possible, a video recording of the ending sequence would be very helpful. There seems to be no real hardware recording available on the internet. Thanks! Awesome! Many thanks for the info!!! Tips to avoid last-level frustration: continue sends you back to the beginning of the level, which is annoying and at the last boss really is not an option. This can be walked around by keeping player 2 alive. No-buy-in-at-last-level also needs to be defeated using dip switches. As for the last boss, its sole weak spot is the blue gem in the back and then only when the wings are spread open. Gunball weapons are the only viable option.